Eggs are used all over the world in folk magic traditions. Eggs have been regarded with reverence for millennia, appearing variously in fairy tales like that of the Golden Goose, in riddles like ‘which came first’ or in healing practices – as when an egg is used to draw out bad spirits in folk medicine. The egg represents limitless potential and the mystery of the origins of life. It sustains us as a staple food, a perfectly packaged and easily digestible protein, gifted by a generous hen every day. 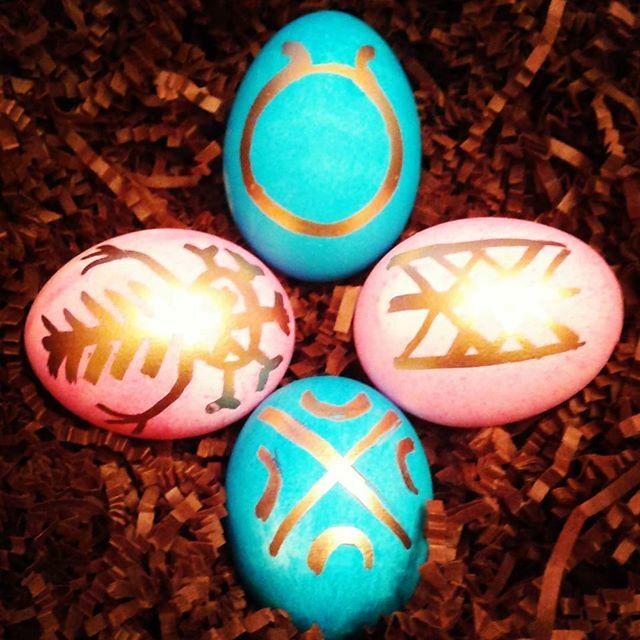 Musing on the connection between the eggs role in healing and providing sustenance, I wondered about the value of applying sigils to eggshells (similar to decorating Ukrainian eggs) and then consuming them to absorb the charged intention in that symbol. Eating an intention to raise the vibration. Slavic egg pattern for the ancestors. “According to many scholars, the art of wax-resist (batik) egg decoration in Slavic cultures probably dates back to the pre-Christian era. They base this on the widespread nature of the practice, and pre-Christian nature of the symbols utilized. No ancient examples of intact pysanky exist, as the eggshells of domesticated fowl are fragile, but fragments of colored shells with wax-resist decoration on them were unearthed during the archaeological excavations in Ostrówek, Poland, (near the city of Opole), where remnants of a Slavic settlement from the early Piast Era were found. With the advent of Christianity, via a process of religious syncretism, the symbolism of the egg was changed to represent, not nature’s rebirth, but the rebirth of man. Christians embraced the egg symbol and likened it to the tomb from which Christ rose. With the acceptance of Christianity in 988, the decorated pysanka, in time, was adapted to play an important role in Ukrainian rituals of the new religion. Many symbols of the old sun worship survived and were adapted to represent Easter and Christ’s Resurrection. Egg featuring a traditional Croatian tattoo design. Bindrune for a Happy Family. Repetitive patterns used in the decoration of these objects relate strongly to decorative elements found in Neolithic pottery, and have been carried forward, disguised in traditional textile patterns. When we look at examples of ethnic costume, we may not be seeing them, but we are exposed to storytelling about the culture of our elders. That kitschy Norwegian sweater that ch‘yer Grandma wears, the Argyle tie or sock, and even the exoteric symbolism of monetized Hallmark holidays, all represent folk culture that has been sanitized and easily packaged for distribution – like the egg today. 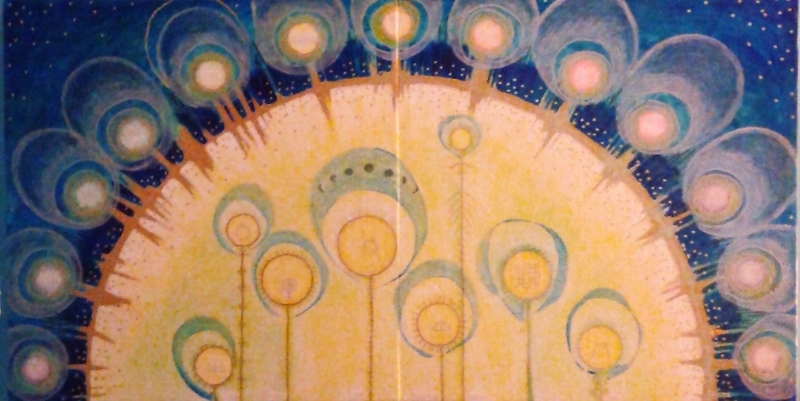 A lunar calendar: 13 moons and 8 quarter and cross-quarter holidays. In my opinion, we should consider these hints a boon toward reclaiming a connection to where we came from, the Earth itself. If we can scrape popularized iconography for deeper meaning, we can fabricate a renewed context for experiencing these seasonal rites of passage together. In Minneapolis, we are fortunate enough to have public celebrations like the MayDay Parade, put on annually by In the Heart of the Beast Puppet Theater, who specialize in the reclamation of story through spectacle. I’ve made it a mission this year to explore commercialized holiday-related ephemera, utilizing them as a jumping-off point to reexamine the ancient traditions they stem from. I’m in search of collaborators who feel some connection to their folk art traditions, in order to develop a synthesis of visual languages that speak to a localized folk culture here and now. How do we take the stories embedded in pysanka or pottery, textiles or tattoos and bridge their similarities to pull out common themes that unite us in championing our environment? Because all folk culture originally stemmed from our relationship to the land. I feel it is imperative to strengthen these connections to be able to practice Rewilding on the scale necessary to combat climate change.